A man has been airlifted to a London hospital with serious injuries following a crash in Broadstairs this afternoon (February 11). Fire, ambulance and police were called to Carlton Avenue at 2.17pm to a crash between a JCB and a motorbike. The motorcyclist was trapped beneath the lorry’s bumper. Carlton Avenue is currently closed off. A Kent Police spokesman said: “Kent Police was called to a report of a collision involving two vehicles at 2.17pm. 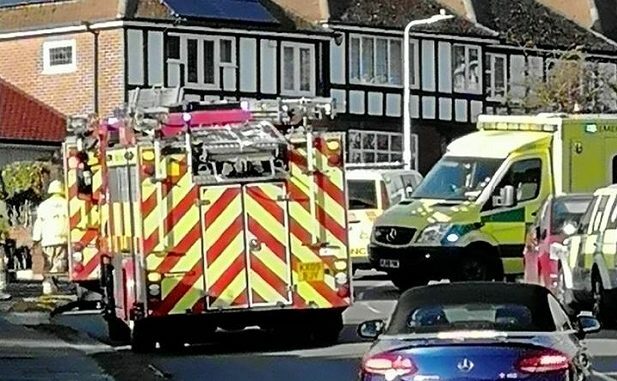 A Kent Fire and Rescue Service spokesman said: “KFRS was called to Carlton Avenue in Broadstairs at 2:13pm to a crash involving a motorcycle and (JCB). Not only has the mans family have the nightmare of a relative being involved in a serious accident they now have the j Journey to London to be with him. The amount of patients being taken to London hospitals from East Kent is absolutely scandalous. The stress on the families especially those who have to rely on public transport to get to and from London must be beyond believe. Not forgetting the fantastic ambulance crews who are being directed to London with very ill patient’s to care for en route. Our local hospitals are being run down from one service after another, Yet the government keep telling the council to build more houses. When the residents who live in East Kent now do not have sufficient health cover if the did there would be no need for them to be taken to London hospitals for emergency treatments. Poor reporting from Isle of Thanet News. Inconsistent time formats and where did the lorry come from? Did you mean the JCB or a separate vehicle. Up your game, you’re supposed to be professionals. Info from emergency services was a lorry, a double check with police came back as a JCB so have altered.